IT’S THE most wonderful time of the year! Around the world, Christmas is the season of getting together, exchanging gifts, sharing meals, and feeling merry. It’s also the time of long-distance traveling, shopping for gifts, and preparing elaborate dinners. Getting ready for the most joyous holiday takes up to 66 hours of your time. 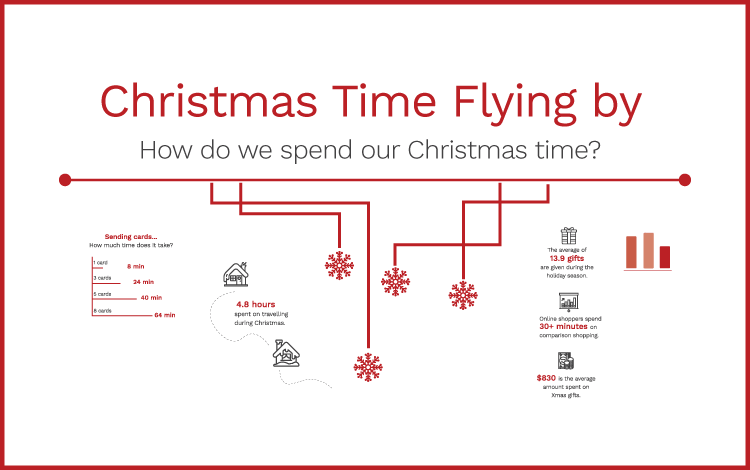 Find out where your time gets lost during Christmas and cut the hours spent on stressing about gifts, travel, and shopping. Sources: Time, Mirror, Daily Mail, Worldatlas, StarNews Online . For your reading pleasure, we also ran some tests in our marketing team to confirm the existing information and to find out what it really takes to wrap a gift or prepare a Christmas punch. We had lots of fun, and hope that so will you.